Should Set Point For Pressure Relieving Device Be Equivalent to Design Pressure? By Himanshu Chichra, Principal Process Safety Engineer and host of ‘Process Safety and Risk Blog’ www.staub-ex.blogspot.com [staub-ex.blogspot.com]. process hazard analysis (PHA), I have come across a general philosophy of keeping the set point of the reactor's pressure relieving devices equivalent to its design pressure. This might be adequate for a non-reactive system. But the question is, is it adequate for a reactive system? Higher set pressure leads to a correspondingly higher "set" temperature (i.e. the relieving temperature). This, in turn, leads to a higher rate of reaction which results in higher self-heating or higher temperature rise rate (dT/dt i.e. deg C/min) and a higher pressure generation rate (dP/dt i.e. bar/min). This is very important because for a chemically reactive system the required pressure relief area depends directly on the self-heating and pressure rise rates at the relief conditions. 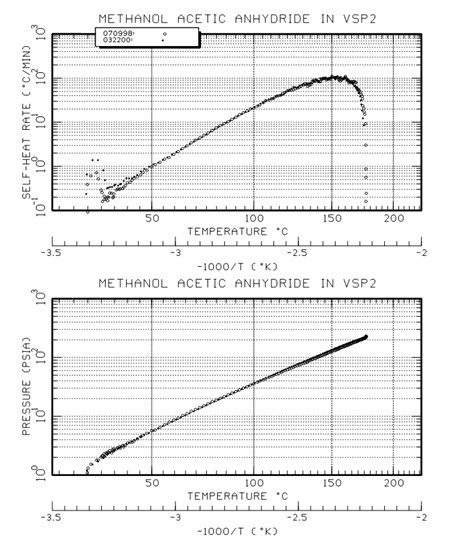 Referring to the below composite graph for the methanol and acetic anhydride reaction (from an adiabatic calorimetry test), we see that at a given set pressure the corresponding temperature value can be obtained from the graph of pressure versus temperature. For example if the set pressure is 20 psi (about 35 psia) then the set temperature is about 99 deg C. Based on that set temperature, the temperature rise rate can be obtained from the plot of self-heat rate (dT/dt), giving a value of about 20 deg C/min in this illustration. The data show that the temperature rise rate increases exponentially with increasing temperature, and the system pressure rise rate must follow. Notice that if the set pressure is higher, say 35 psig (about 50 psia) then the set temperature is about 110 deg C and the corresponding self-heat rate is about 34 deg C/min. The implication is that at the higher set pressure the reaction rate is higher and the required pressure relief (vent) area is therefore larger. Recall we have discussed T2 laboratories in my previous blog post, https://staub-ex.blogspot.com/2018/05/relief-device-sizing-and-worst-case.html [staub-ex.blogspot.com], where the process was to batch load three different reactants, heat them to 99 deg C, start the agitator and continue heating to the process temperature. There was a provision of cooling water for reactor mass cooling and the reactor was provided with a 4" rupture disc with a set point of 400 psig. But on the day of the incident, cooling system failure resulted in runaway of the desired reaction, which further led to a second undesired exothermic reaction. The set-point of Rupture Disc was too high which led to an even higher temperature before the opening of the rupture disc. Higher temperature resulted in an increased rate of reaction and the 4" rupture disc was not sufficient for the required relieving rate causing the explosion. With lab trials, it was proved that the same 4" rupture disc with a set point of 75 psig would likely have been sufficient to relieve and prevent the reactor explosion. This should make it clear that if a pressure relieving device is set at a lower pressure for a chemically reactive system, the size of the pressure relieving device will be smaller as compared to the size of a relieving device set at high pressure for the same system. Thanks for reading the post. Let me know if you have any comments or queries on himanshuchichra@gmail.com. Also, you can share topics which you would like to learn about and I can consider these topics for my future blog posts. Mr. Chichra is a guest blogger with whom Fauske & Associates, LLC (FAI) have recently worked to support customers in India. Read more of his posts related to process safety at www.staub-ex.blogspot.com [staub-ex.blogspot.com] and subscribe to FAI's blog to never miss out on any new process safety content.